James Stokes was a Scottish born recipient of the Victoria Cross, although both his parents were Irish and he considered himself as much Irish as Scottish. Despite his background Stokes served in North West Europe with the 1st Battalion King’s Shropshire Light Infantry and was awarded a Victoria Cross for bravery at Kerbenheim on 1st March 1945. In Holland, on 1st March, 1945, during an attack on Kerbenheim, Private Stokes was a member of the leading section of a platoon pinned down by heavy fire from a farm building. Without waiting for orders Private Stokes dashed through the enemy fire, to disappear inside this building. The fire stopped, and he reappeared, wounded in the neck. This valiant action enabled the platoon to advance to the next objective. Private Stokes was ordered back to a Regimental Aid Post, but refused to go. The platoon then encountered heavy fire from a house on the left. Again without waiting for orders, Private Stokes rushed the house by himself and all firing from it ceased. His gallantry enabled his platoon, which he subsequently rejoined bringing five prisoners, to continue the advance. In the final assault Private Stokes, now severely wounded, once more dashed to the objective through intense fire. He finally fell, firing his rifle to the last. It was found that he had been wounded eight times in the upper part of the body. Private Stokes’s one object throughout this action was to kill the enemy, at whatever personal risk. His magnificent courage, devotion to duty, and splendid example inspired all around him, and ensured the success of the attack at a critical moment; moreover, his self-sacrifice saved his Platoon and Company heavy casualties. 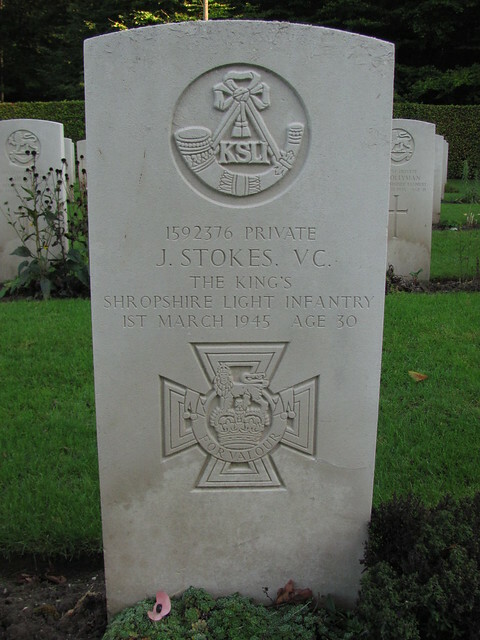 James Stokes is buried in the Reichswald Forest War Cemetery.